SHANGHAI (AP) — Authorities in China have cracked the country’s biggest-ever underground banking network, which handled illegal foreign exchange transactions worth 410 billion yuan ($64 billion), police said. The bust comes amid a month-long crackdown on illicit outflows, which officials say disrupt China’s financial management, facilitate corruption and help terrorists and criminals launder their dirty money. Over 370 people were detained, prosecuted or otherwise reprimanded in the case, police in Jinhua city said in a statement on their website. Jinhua is in Zhejiang province on China’s eastern coast, a zone known for its shadowy financial networks. Police said one leader of the Zhejiang network was a man named Zhao Mouyi, who transferred over 100 billion yuan overseas using 850 different bank accounts and a dozen Hong Kong front companies. It took police nearly a year to sort through over 1.3 million suspicious transactions, they said. Since April, Chinese authorities have uncovered over 170 big cases of underground banking and money laundering worth over 800 billion yuan ($126 billion), the state-run People’s Daily reported. 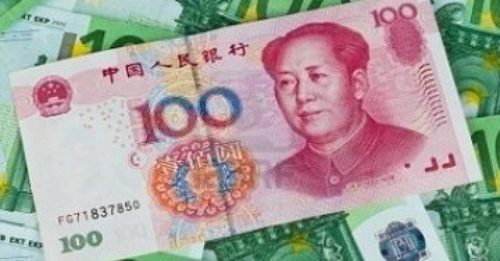 China has tight currency controls, which officially limit individuals to converting $50,000 worth of currency a year, but they are widely evaded. That has helped drive capital outflows to enormous levels this year, adding to strain on the value of the Chinese currency and putting upward pressure on interest rates, even as the Chinese economy slows. Beijing has also launched a massive campaign to crack down on corrupt officials overseas who have taken their fortunes out of the country, part of an effort to shore up the reputation of the ruling Communist Party. Brian Jackson, a senior economist for IHS Economics in Beijing, said the crackdown may be aimed, in part, at staving off capital flight led by insiders as China prepares for another round of state-owned enterprise reform. That was a problem when China restructured massive state companies in the early 2000s, he said. Money brokers routinely help individuals and businesses skirt foreign exchange restrictions and onerous bank bureaucracy. Some use such services to facilitate legitimate business, but others may be trying to hide illicit wealth. Transactions can be done in real time, using Internet banking, eliminating the need for deep networks of trust and familial ties. Such brokers are easy enough to meet, even in Shanghai, at the branches of major Chinese banks including the Bank of China and China Merchants Bank. One broker, who spoke on condition of anonymity to discuss illegal activity, said he could make a real-time transfer to a dollar account in Hong Kong for a fee of roughly 1.6 percent. His minimum was $100,000, twice the official limit, and said he had done transfers as large as $5 million. “China’s foreign exchange control is pretty useless,” said Yin Zhongli, a deputy director at the Chinese Academy of Social Sciences’ Institute of Finance. Associated Press researchers Yu Bing in Beijing and Fu Ting in Shanghai contributed to this report.